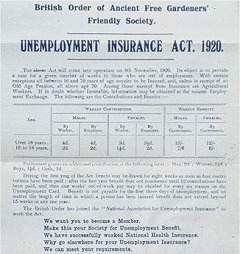 The National Insurance Act changed friendly societies. Those that were strong could become 'approved' under the act to administer its provisions for their members. However, each individual lodge was too small. 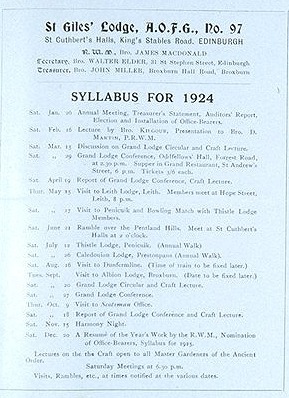 Even the total membership of the lodges affiliated to Grand Lodge in Edinburgh was too small. So throughout 1911 all the lodges of the Ancient, the British, and Western Orders and the unaffiliated societies met. Together they numbered around 70-80 lodges and 12,000 free gardeners. Delegates discussed the formation of an association of 'Free Gardeners in Scotland for the purposes of the Act (Section 39)', whilst 'maintaining their craft connection with the Orders'. In March 1912, 44 societies (lodges) from all orders and none joined a new association, the Ancient Order of Free Gardeners (Scotland) National Insurance Association. 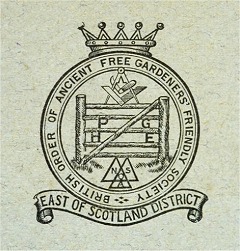 Some lodges did not approve the terms and conditions of the Association and instead joined the British Order of Free Gardeners. It was large enough to become approved in its own right. 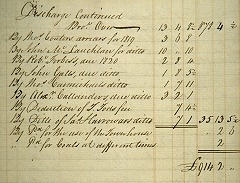 Most lodges kept this complicated set of insurance transactions separate from 'craft' practices (their ritual traditions). So, for example, Penicuik Thistle remained affiliated to the Ancient Order for craft purposes (where it was No 2 and male only) but opened a new approved society affiliated to the British Order for insurance purposes in May 1912 (where it was No 479 and open to both men and women)! Many lodges decided to close: Dunbar's Black Agnes Lodge and Bonnyrigg's Dundas Lodge of the Ancient Order both took that path. Still lodges were created. Mindful of their traditions, members of the Ancient Order created a special 'craft' lodge in November 1921 called St Giles. It was open only to Past Masters and others interested in the rituals of the Order. For 30 years the friendly society sector delivered state welfare. But the Labour Government elected after the second world war nationalised the whole process. From then on the State took all responsibility for benefits and pensions. With their main reason removed friendly societies quickly declined. Their staff became civil servants almost at a stroke. Their members deserted in droves. The few that stayed found it difficult to attract new ones. By the end of the twentieth century free gardeners in Scotland had shared the fate of many other similar organisations - they were extinct.